This picture is one of six reasons why, at the moment, my mother is not very happy with me. I have a problem. It’s now been a week and a day of my visit home to my parents. In that time, I’ve baked three dozen mini matcha shortbread cookies, a dozen almond rosemary shortbread cookies, some topsy-turvy cinnamon rolls (next time I’ll roll you properly, little ones), pumpkin cupcakes, and green tea cupcakes. It’s a little excessive. It’s gotten to the point where, every time I come into the kitchen, my mother cries, “Not again!” and leaves the room muttering about her waistline. For most of these things, I have a valid defense. We’re giving them to friends! The green tea cupcakes were (almost) vegan! There’s Greek yogurt in these! I made half-batches of everything! But … I also made these pancakes. And they have no defense whatsoever. They have Nutella, espresso, and chocolate chips, and Nutella on top, and more chocolate chips on top, and also some powdered sugar because, because. There is nothing healthy about them. I’m sorry, Mom. But maybe one of you can save them for after your next casual marathon, or something. I did use a slightly different base for the pancakes than the one in my first basic pancake recipe, though I can’t tell you which is better because the chocolate and coffee flavors made them hard to compare — texture-wise, however, both are quite fluffy and tasty. While the other one was based on Jamie Cooks It Up!, the proportions here were based on Joy the Baker’s Milk Chocolate Chip Buttermilk Pancakes, and I first saw this chocolate and espresso flavor combination done by Ozmundaregalis. Note that these pancakes do have the tendency to be a bit bitter from the coffee. If you like your coffee black I suspect you won’t mind a bit; if you don’t, just a bit of Nutella on top will balance out the bitterness, or you can simply omit the espresso altogether and just have chocolatey chocolate pancakes. 1. In a medium bowl, sift together the flour, sugar, baking powder, baking soda, and salt. If using instant espresso powder, sift it into the dry ingredients as well. 2. In a separate large bowl, beat the egg. Add milk (or buttermilk, or yogurt+milk, whatever you’re using), melted butter, vanilla, and Nutella. If using liquid espresso or coffee, add that here as well, and mix until well-blended. Note: I used a 1/2 cup of Greek yogurt and a 1/2 cup of milk as a buttermilk substitute, but I felt that the other flavors in these pancakes were so strong that the buttermilk might not be necessary. 3. Fold the dry ingredients into the wet until just incorporated. A few lumps are good. Let batter set for a few minutes. 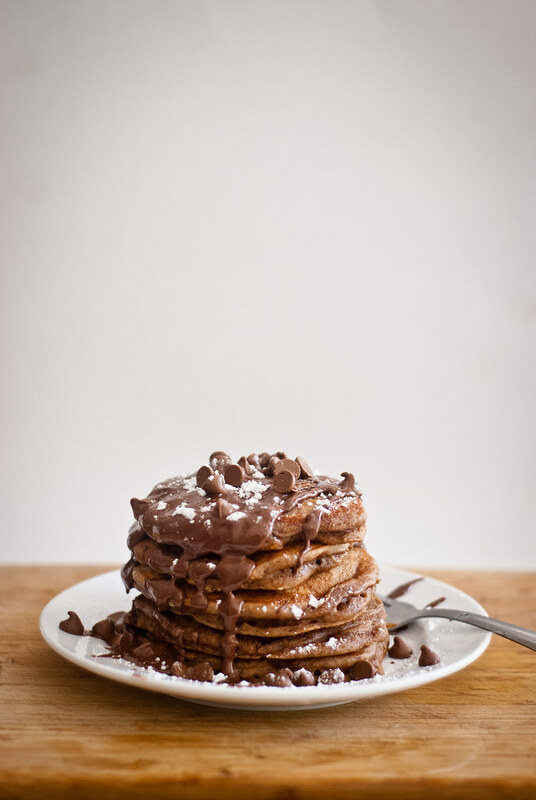 Next on my list of pancakes to try are buckwheat (these banana buckwheat pancakes by The Pancake Princess look so great) and at some point I need to stop being lazy and try the method of separating the egg yolk and white. I’ve never felt the pancakes needed to be fluffier, so I never feel the compulsion, but I really should just do it and see! LORD HAVE MERCY. I’m done. So completely done. These look divine. Haha you are so spot on with this comment!! That’s exactly why I love baking at home (my mom has TWO ovens — whaat — and an actual stand mixer!) and this was indeed our Sunday brunch 🙂 Thanks so much for your comment, Cate!! OMG! So suddenly, your blog is no longer blocked from my server or whatever and now I can see your lovely blog!! SO MANY PANCAKES YUMMM. These sound absolutely heavenly. No words. Wow, these look incredible! Cannot wait to try them out! Maybe some banana on the side would be good too?? Add that healthy aspect?! Mmm, yum. Oh, I think some banana would be FABULOUS! 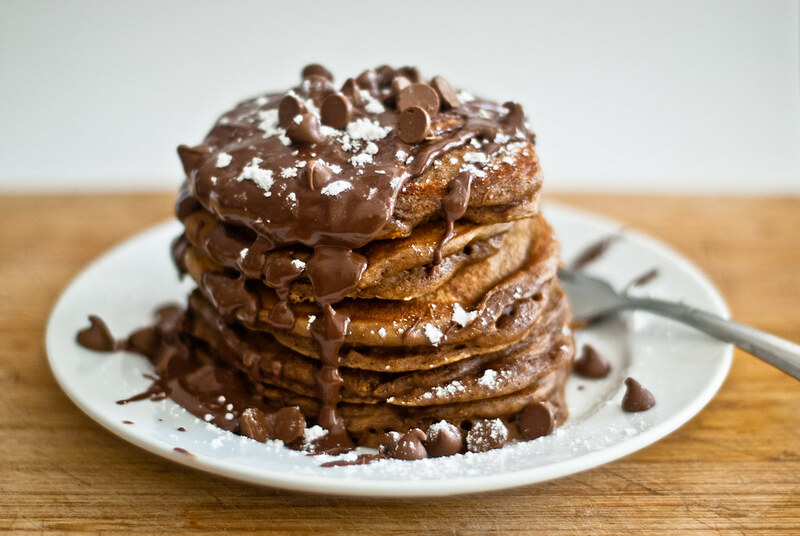 These pancakes desperately need a healthy aspect, that’s for sure! I actually think banana might compliment the Nutella and chocolate chips better than espresso… Definitely going to try that next time, thanks for the genius idea. 🙂 And thank you so much for your comment! They looook soooo goood!! So much beautiful chocolate, yum! 🙂 🙂 Right? You can always count on coffee and chocolate. Thanks so much, Ev!! 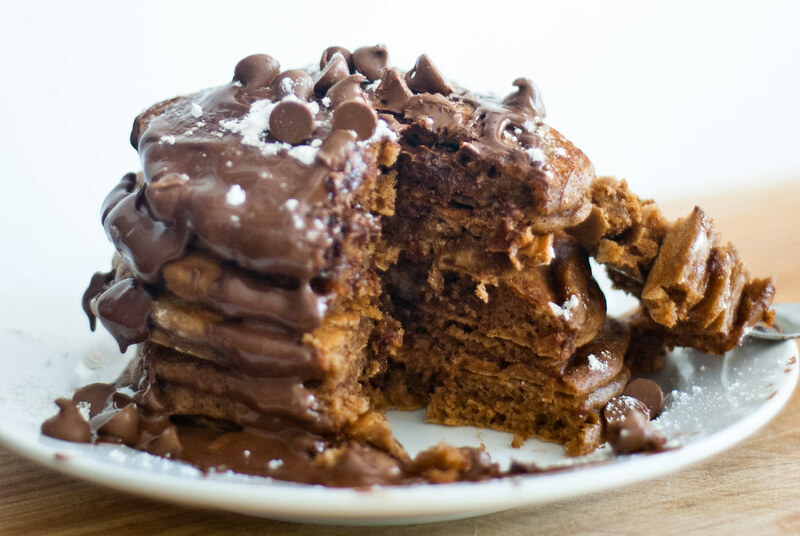 Thanks for stopping by my blog – these are gorgeous pancakes! 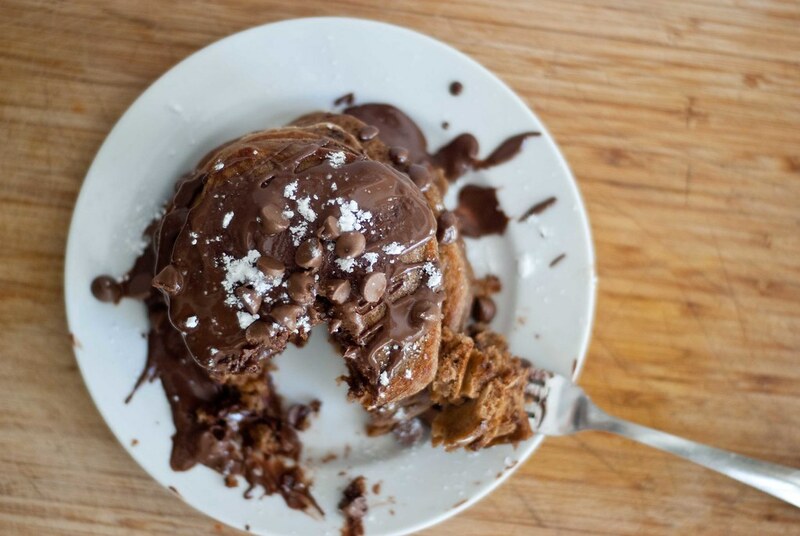 Nutella & espresso for breakfast in a fluffy format, I’m in! Pinned! Ahh, thank you so much, Averie! You’ve made my day 🙂 I love your blog and all your fantastic baked goods, so thank YOU for stopping by mine! when at home i have my coffee black and since ive been doing that fancy store cflat whites are just too weak… so I was thinking of laying off for a while… then I came across this. Can I ask which lens you have? You pictures are amaaaazing im so intrigued! Haha! I feel like this post is such a bad influence in comparison to all the lovely healthy foods I see posted elsewhere 😉 But yes, one of the things I really liked about these pancakes was that I could actually taste the coffee flavor! Of course! (And that is SO flattering, I am such a beginner!!) I just started using a 50mm f/1.8 prime lens and I’m totally in love with it. The pros are that pictures turn out SO wonderfully sharp and crisp, the aperture gets nice and wide, and it’s also a relatively inexpensive lens (lol, relatively speaking) as well as nice and compact. The only con for me so far is that overhead shots are a little hard with this one because you have to be farther away to get everything in — I end up holding the camera way over my head and just hoping it’s pointed in the right direction, haha… or standing on the table. For that reason I can maybe see why a 35mm might be better, but those will run a bit more. I just ended up saying way more than I intended, hope I wasn’t just telling you everything you already knew!!! I thought your photos were fantastic, myself. Be still my heart, that looks wonderful! Can you save some for strategy? Aw, thank you! Yes, it’s definitely not for every day, but it’s a serious treat when you do decide to splurge! YAY!! That makes my day — thank you so much for letting me know! Ford’s technique worked and the image has since become synonymous with the house, and Opium – which was first launched in 1977 – remains one of YSL’s best-known scents.